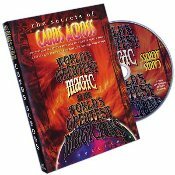 Today, when you order "Cards Across (Worlds Greatest Magic)", you'll instantly be emailed a Penguin Magic gift certificate. You can spend it on anything you like at Penguin, just like cash. Just complete your order as normal, and within seconds you'll get an email with your gift certificate. Standing ovation for this dvd. Another WGM hit. Ammar's routine is applause worthy Great show stopper jaw dropper and Harlan's routine is ok. Very entertaining just like they always do(WGM). For your parlor or close-up show this is really recommend by me. Lastly, everthing which consist of WGM= When can I have you back for another show. And that's what its all about. manner that can be used on stage with two volunteers. It was primarily a close up effect. the more difficult it was to understand him. This is one of my favorite tricks. I love watching it performed by real magicians. I’m still practicing the easier versions. What’s great is that there are multiple versions by some of magic’s Greats.